Action from a recent Yaxley game at In2itive Park. Yaxley can consolidate third place in the United Counties Premier Division with a positive result against Sleaford at In2itive Park tonight (March 14, 7.45pm). The Cuckoos agreed to delay this fixture from Saturday (March 11) so Sleaford’s players could attend Lincoln City’s FA Cup quarter-final at Arsenal. A win for Yaxley would take them to within seven points of second-placed Deeping Rangers. 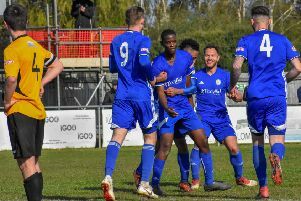 Stamford AFC are defending a three-game unbeaten run in Division One South of the Evo Stik Northern Premier Division when they travel to lowly Loughborough Dynamo tonight.